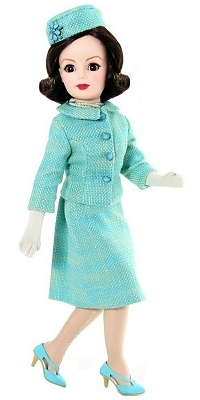 Looking like she just walked down the halls of the White House, Retro Revival Jacqui, with dark brown hair and brown eyes, is as elegant as a queen in her sea foam green and blue tweed suit. It has the classic boxy jacket and slim fitting, knee length, skirt of that time. Pearls around her neck, blue, T-strap shoes and her familiar pill box hat made out of the same fabric as the suit, adds to a look that is so reminiscent of that time which was known as "Camelot". Limited Edition of 200 dolls. Retired item - available for limited time.